The crew quickly pulls the first victims from the water and takes them on board the 'Esvagt Connector' for treatment. 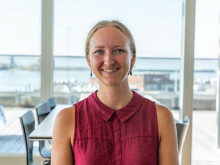 Pia Frandsen, nurse at Maersk Training, rounds up her briefing of Person #9 and adds soot stripes to his face before turning her attention to Person #10 who has ”a broken lower arm and is suffering intense pain”. It’s a Thursday afternoon at Dokhavnen in Esbjerg and 18 actors are waiting for disaster, which will soon happen when the actors enter the water at Maersk Training’s exercise platform, ’Stardos’. “Get ready to launch the boat in the water,” he says over ’Esvagt Connector’s loud speaker system. Henrik Pedersen sounds the Man Over Board alarm on the ’Esvagt Connector’. 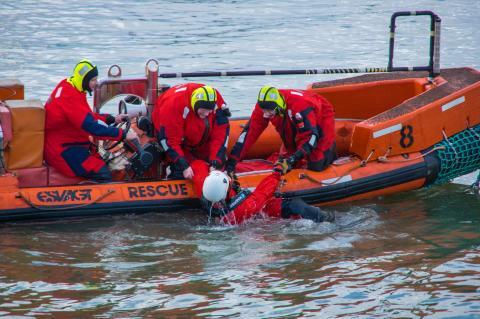 The boatman and two crew members quickly and safely man the Fast Rescue Boat (FRB) while Henrik Pedersen tries to ascertain how many people the FRB needs to rescue. The bridge of the ’Esvagt Connector’ buzzes hectically. The ’Stardos’ reports that it is unable to launch their lifeboat – we are jumping into the water! – and Henrik Pedersen starts to juggle updates to the FRB, dialogue with ’Stardos’, orders and messages to the crew and ordering of rescue helicopters. The coffee sits untouched, growing cold in the cup. The FRB rescues the first two from the water, evacuates them to the ESVAGT vessel and rushes off to rescue the next ones. 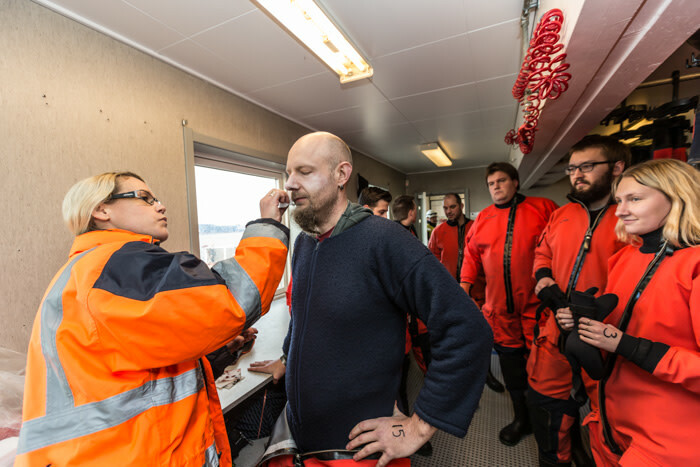 The crew of the ’Esvagt Connector’ takes the rescued men below deck to the chief officer and medic, Mogens Jeppesen and to deck hand and AMA (advanced medical aid) André Bendixen in the hospital on board. “I can’t breathe,” gasps one actor, while another is bleeding from an open wound. The deck is covered in water. André Bendixen and Mogens Jeppesen receive new patients all the time; they are surrounded by cries of pain and moaning. Person #9 had been allocated a treatment couch but is now getting in the way in the hospital before a crew member takes him out of the way. Below deck things are calmer. 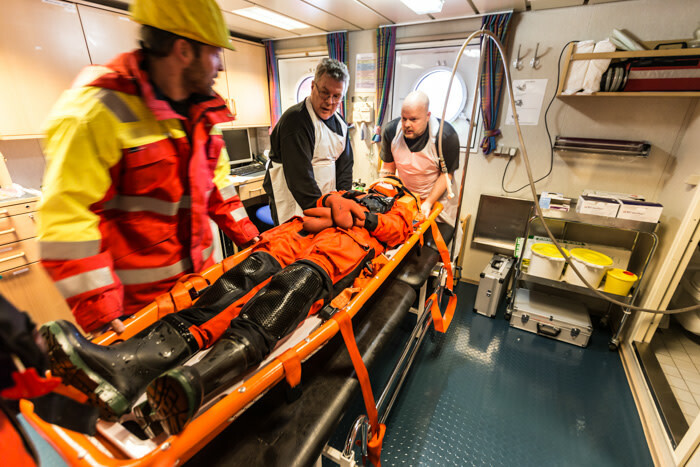 First aid treatment is finished and the crew accompanies the four who are most injured up on deck so they can be readied for helicopter evacuation. One has a broken back and has been strapped to a spine board. “They are going to take you to hospital. They will soon patch you up again. You’ll be as good as new,” promises a crew member to a crying actor. Nurse Pia Frandsen and Fleet Manager, Asger Stürtzel Sørensen, look at each other. The helicopter evacuation is the final stage of their planned disaster and the day’s exercise will soon be over. “Thanks for your help today,” says Asger Stürtzel Sørensen, and suddenly everyone is cured and smiling – and the crew breathes a sigh of relief. ”You were really heavy to move,” laughs one of the crew to the actor who lay unconscious in the corridor. The actors disembark and the crew gathers at the bridge for an evaluation. “Well, what did you make of that?” asks Asger Stürtzel Sørensen. “Hard! But just as we expected it to be,” says one of the crew. “The actors were good. They really stressed us,” says another. “Everyone got into the spirit of the exercise and did what they had to do and what they could do. There were a few small things that happened, as they always do when it really counts. You can’t predict everything and the most important thing is that you always do what you deem best in the situation at hand,” he says.